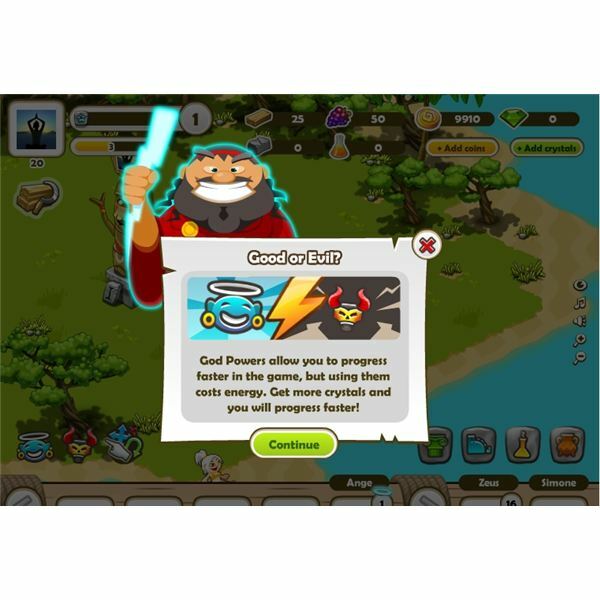 Island God – Be Good or Evil? Digital Chocolate has added a new twist to the standard city building sim genre with Island God. Instead of being helpless castaways players become a God in control of their own island and people. Natives bow down and worship you. Choose to be a merciful or vengeful deity while building a society from scratch. Watch from above and intervene however you see fit. Customize your tribe. Assign them jobs collecting resources or paying homage to your greatness in a tribal chant. 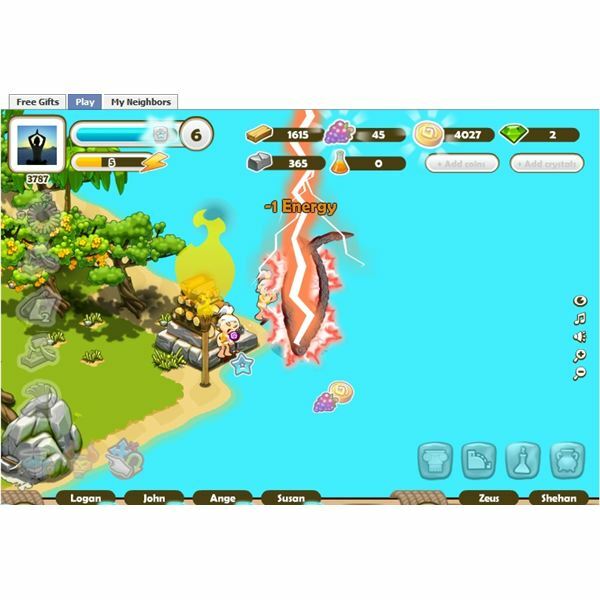 Unlike other Island games online such as Happy Island or Island Paradise monstrous creatures will randomly attack islanders. Players can use their godly powers to immediately save their natives or watch them struggle for a bit. Reign as a powerful deity. 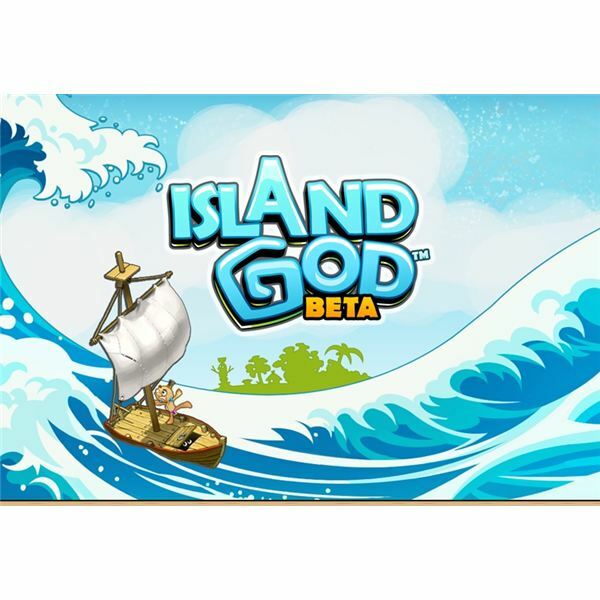 In Island God players are chosen by Zeus to be God over a small remote island. As ruler they must guide the natives in building a flourishing society. Most of the gameplay consists of completing quests, constructing bungalows, producing food, gathering resources, increasing population, and fighting off monsters. 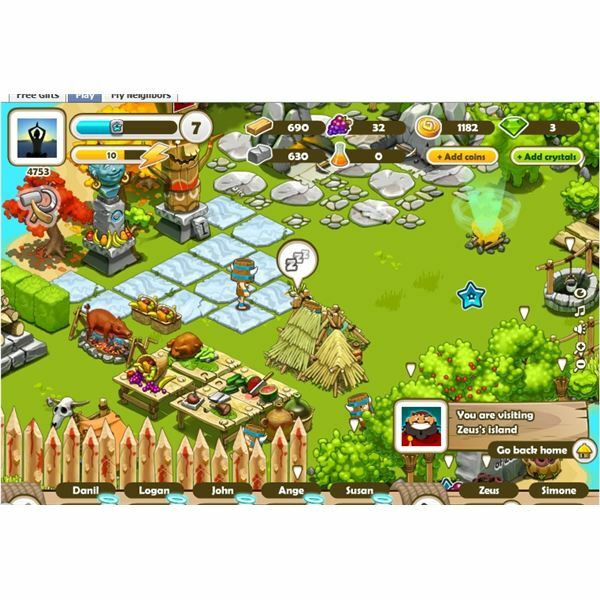 Quests revolve around improving the island. Tasks usually require users to buy decorations to spruce up the place or collect an allotted amount of resources. Build bungalows to boost tribe population. The construction of building can be tedious. Players need a decent amount of active neighbors to help send various materials like nails to finish buildings. Plant a fruit tree or bush for food. There’s also a small farming option where players can grow corn for food which can be used to buy energy. Purchase woodcutters and quarries to make resources. Click on natives to pick them up and drop them onto objects to assign them a task. The God feature makes it stand out from standard island games online. Players can choose to intervene as a good or evil deity sending blessings or smite to complete tasks or attack threatening creatures. Click on the good or evil icon to choose the source of power. Then click on monsters like the tactless turkey, boar, or giant octopus to banish them from sight. All God actions utilize energy. The graphics and sound effects in Island God are great. Players enter a vividly animated tropical island setting. Beams appear when blessing natives and mighty thunder strikes down below when evil Gods display smite. Upon returning to the island Gods will notice their tribe frantically scattering back into their previously assigned positions. There’s a funky tribal beat played throughout the game. True-to-life jungle noises, chimes ring, sinister growls, native gibberish, and a wide range of authentic sounds for each action performed add a dose of excitement. The customization is nice. As players level up they can change their tribe appearance to pirates, brutals, agents, or explorers. Decorate with various flowers, fountains, bungalows, trees, flags, fences, lanterns, and even drop a few beastly remains to spruce up the place. Island God is a fun game. Players get to play God which doesn’t happen often. Become an all powerful deity in control of a tropical island and the inhabitants. Make them work, worship, and research. Decorate and design to turn the barren isle into a heavenly oasis. Help them fight off beasts from the sea and land. Build a growing society as a good or evil God. It also features a farming option for those FarmVille addicts who can’t go too long without harvesting. Players that enjoy island games online or city building simulations will find this gem from Digital Chocolate extremely entertaining.